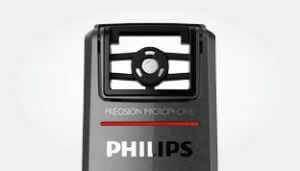 In the field of desktop dictation microphones, the ubiquity of Philips’ range of devices is most readily apparent in the eponymous use of the term ‘SpeechMike’ when referring to any kind of desktop dictation device. This proprietary eponym has long favoured Philips in this field, and with good reason. Their line of SpeechMikes has consistently delivered high quality performance and utility, and this high standard continues with the recent release of the Philips SMP-3700. This release is of particular significance as it coincides to some degree with the release of the rival Olympus RecMic II series. Long left out of this monopolised field of desktop dictation devices, Olympus’ previous desktop dictation device series (the DR series) struggled to gain significant traction commercially. The new RM-4010P from Olympus looks to change this. It inherits many of the design elements of its predecessor, while at the same time innovates in a number of key areas. At first glance, these two devices do appear remarkably similar, with nearly identical key layouts, strikingly similar form factor and shape, and the same USB cable connectivity. The only noticeable difference appears to be Olympus’ retention of the trackball from their previous models, instead of Philips’ touch sensor. For many, this may seem a negligible difference, however in my time with these devices, I found myself gravitating much more to the tactile precision and dexterity afforded by the RM-4010P’s trackball. That being said, opinions on the trackball versus the touch sensor were split when showing these devices to my colleagues. Ultimately this will come down to personal preference. The new RM-4010P from Olympus … inherits many of the design elements of its predecessor, while at the same time innovates in a number of key areas. Plugging in and configuring these devices for use showed up further disparities. Central to Olympus’ marketing strategy for the RM-series is the device’s “plug and play” feature – promising prospective operators of the device unparalleled ease of use. The RM-4010P automatically switches between four different configurations: Dragon Speech Recognition mode, Windows Speech Recognition mode, ODMS mode, and custom mode, depending on what application it is interacting with at any given time. When compared to the SMP-3700’s two modes (event mode and keyboard mode) this added functionality seems quite exceptional. Furthermore, any additional adjustments required for the RM-4010P can be configured either by pressing the right combination of keys, or, for those looking to further customise any or all elements of this device’s operation, by opening the RecMic Configuration Tool software. The Philips Device Control Centre does feature a similarly extensive list of customisation and configuration options; however, I found this to be more of a necessary step for using this device, rather than an added extra. I was also impressed by the device’s seamless integration with the Olympus Dictation Management System. Upon first plugging the device in, I was immediately taken through a short series of step-by-step questions which asked how the device will be used and in what kind of audio environment. These settings largely focused on the variability and directionality of the RM-4010P’s microphone, allowing the user to optimise the microphone for the kind of audio environment they will be using it in. Pleasingly, both devices performed exceptionally well when put through a series of recording tests, ranging from perfectly quiet to quite noisy environments. With Philips’ decoupled “free floating” microphone in the SMP-3700 and Olympus’ dual omni-directional microphones in the RM-4010P, background and intrusive noises are ignored, as the microphones are aimed directly towards the speaker. Both devices produce clear and audible dictations, even in noisy environments, and the built-in pop filters featured in both devices help clean up any additional unwanted noise. Recordings can be reviewed without the need for an additional headset or set of speakers, as both devices are fitted with on-board speakers that do not disappoint in terms of both clarity and volume capabilities. Ultimately, both of these devices can be trusted for anyone looking to dictate directly into dictation management software on their computer. 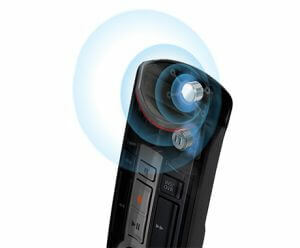 Olympus’ innovations with the “plug and play” usability will not go unnoticed by those that choose this device. These innovations show great promise for Olympus’ future in this field of desktop dictation devices that has for so long been dominated by Philips. Readers will be pleased to know that both these devices are now available for purchase through the Pacific Transcription online shop. The Olympus RM-4010P, and the Philips SMP-3700 can be yours today for around the $400 mark. Pacific also offers the current generation of Philips SpeechMikes in the wireless pushbutton (SMP-4000) and slider versions (SMP-4010). Please feel free to speak with our helpful staff at Pacific Transcription on 1300 662 173 or via products@pacifictranscription.com.au if you require assistance choosing the right product for you.